Please contact us about 2019 Art Classes! Group and Private lessons. Tailored to your needs. Contact Wendy Schaefer-Miles or [email protected] - 715-538-4625 please leave a message or text. Art Classes Winter January to March 2019 - Whitehall and Eau Clarie, WI. One class or schedule four and get a coupon for one free class! Can't make these scheduled classes? Let us know! We can always work something out. If you can't make a class or we have inclement weather, we will reschedule. $40 per class supplies provided. Pre-pay for four classes $160.00 and receive one free class coupon! $35 per class bring your supplies Pre-pay for four classes $140.00 and receive one free class coupon! Payments accepted on our website. Phone or email via a Pay Pal. Checks or cash are also accepted. Painting and Drawing Art Class for the Artistic and not so Artistic. 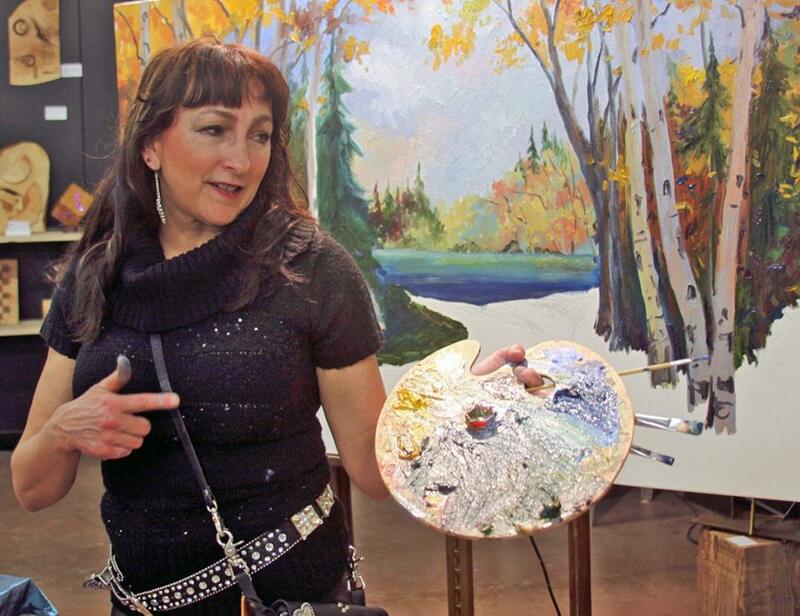 Oil, Acrylic, or Watercolor painting, and drawing classes available. As well as mediums such as pastel and India ink. For adults, teens and art school students. This is your studio time to work at your own pace. Finish a work in progress or start a new painting. Challenge yourself in camaraderie with other creatives. Guidance will be given depending upon each student's needs and interests. Tips on composition, color, texture, style, perspective, shadow and light. Encouragement to develop your own style by learning from artists throughout history. Let us know if you need a list of supplies to get started in the medium of your choice. You can buy a basic kit to get started from us or purchase advanced supplies that we love. Bring a Friend! One class or many! Mix it up pick your class times at a different location! Join us for an inspiring drawing and painting session for the artistic and not so artistic. Watercolor, Acrylic, Oil, Pastels...this is your studio time with co- creatives. Wear clothes you can paint in. Follow along or paint your own vision! Tons of tips advice and fun! Bring your own supplies or let us know and purchase what you need to get started. for the artistic and not so artistic. Adults and Youth Welcome. Follow along and create a work of art where everything you need is provided. Take your painting home at the end of the night, or do your own thing with your own supplies and enjoy the company of other enthused creative participants. All painting and drawing media are welcome. Wear clothes you can paint in we are providing acrylic paint for the classes. Or suggest your own themed party! SCHEDULE YOUR GROUP AND RECEIVE YOUR SESSION FREE! OUR PLACE OR YOURS! Outside Workshops & Demonstrations. Designed for your group or organization. 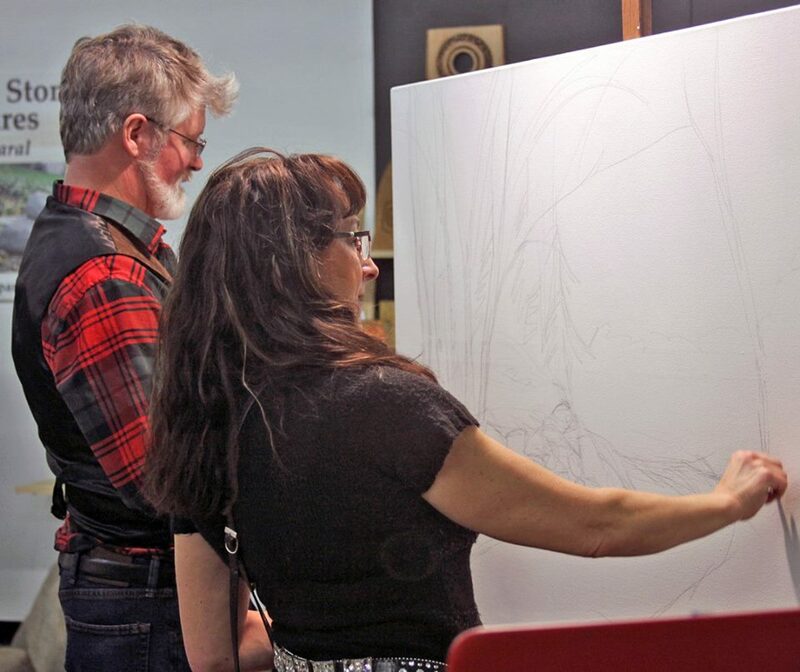 Two Artists with One Vision, working side by side on the same canvas. 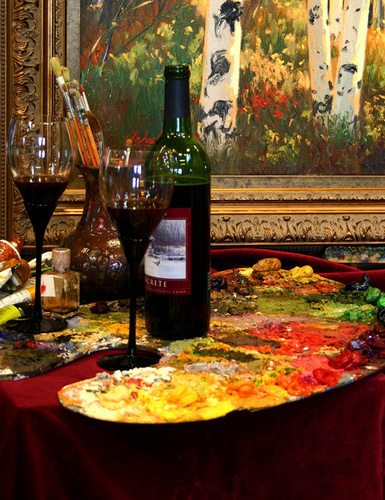 They paint finely detailed oil paintings of lush landscapes from their travels. The artists have studied the techniques of the old Masters to the Impressionists and utilize these methods to create their own unique style. Learn tips, tricks and techniques: get hands-on experience from two artists, each with their own approach and methods. Art talk at 7pm with small demo continuation of previous nights work. Open to the public. Three hour question and answer talk and discussion about Living the life of an artist. Creativity, Business, Life, family and Passion. 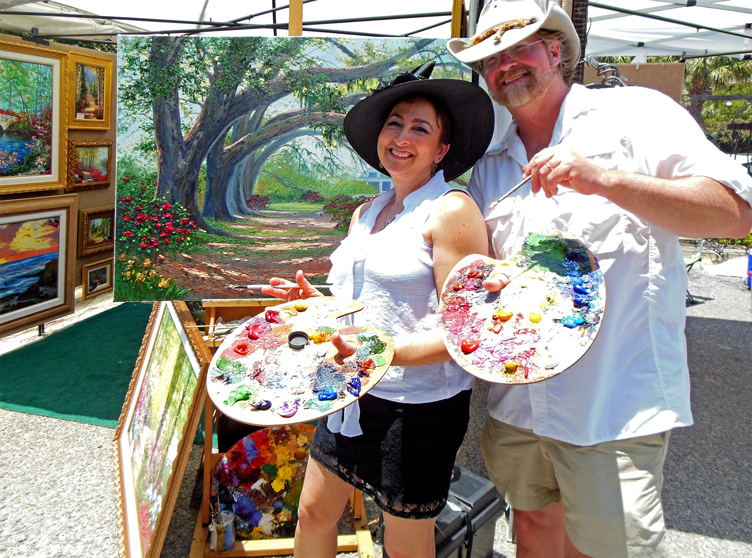 Kevin and Wendy are a creative husband and wife that have worked professionally on their art since 1988. Find out what it really takes to live the artists life. Call for pricing for time and travel. Call for scheduling and pricing for your organization. Please call or email to register in advance. Or call to schedule a time good for your own group or party. Call for Private lessons. Call to join the fun! Call to schedule your own painting date!